Disneyland, “The Happiest Place on Earth”, some may say. Home to Mickey Mouse, many amazing rides, and food. People come from many different places just to get a taste of Disneyland food. Of course, Disneyland has even better food during the holidays. But which ones stand out from the rest of the Disneyland holiday food crowd. First there is Valentines Day. Valentine’s Day is one of the most loved holidays in American history, and what a better place to love some food than at the Disneyland Resort. First up we have Strawberry Funnel Cake. The Strawberry Funnel Cake is located at the Stage Door Cafe in Frontierland at the Disneyland Park. The Strawberry Funnel Cake is a base of crispy, funnel cake, topped off with sweet candied strawberries, lightly dusted powdered sugar, and your choice of a rich, smooth, bittersweet dark chocolate drizzle. The last one for Valentine’s day is the Strawberry Beignet Sundae. 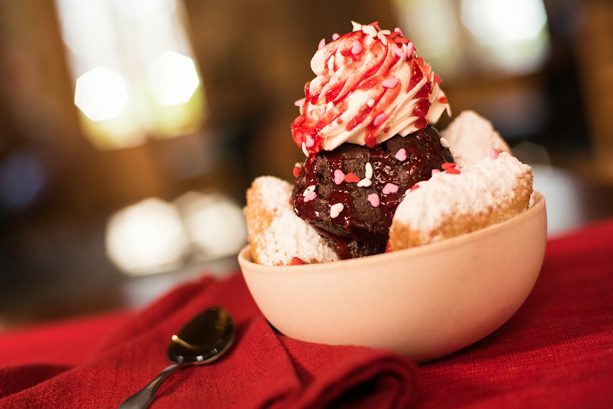 The Strawberry Beignet Sundae is located at the Mint Julep Bar in New Orleans Square. This yummy treat is a beignet, baked with with fresh strawberries, covered in freshly made vanilla bean ice cream. You can get this with a smooth, sweet, milk chocolate drizzle, or a tart, sweet strawberry dip. The next major holiday Disney goes all out for is Halloween. Halloween is the scariest time of the year and to haunt your taste buds there are yummy treats to eat at the “Happiest Place on Earth”. First up we have, The Golden Horseshoe Churro, located in the Golden Horseshoe in Frontierland at the Disneyland Resort, is a churro sundae, with cookie butter gelato, cinnamon sugar churro, topped off with cajeta (caramel) and whipped cream. If you are in the mood for a sweet, seasonal treat I would definitely recommend trying this. The next seasonal treat would be the Orange sugar skull Pot De Creme, which is pot de creme topped off with a orange sugar skull. 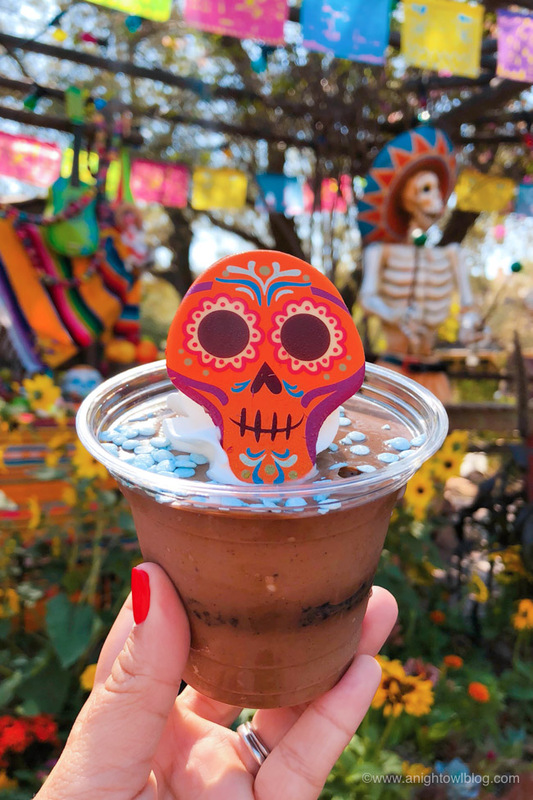 This treat was inspired by the orange sugar skulls that were in the animated Pixar movie Coco. What is a holiday without food? Well what is better than spending the holiday season at Disneyland eating the food provided there. The first plate of food up is Lamb Kofta, which is located at the Bengal Barbecue in Adventureland. 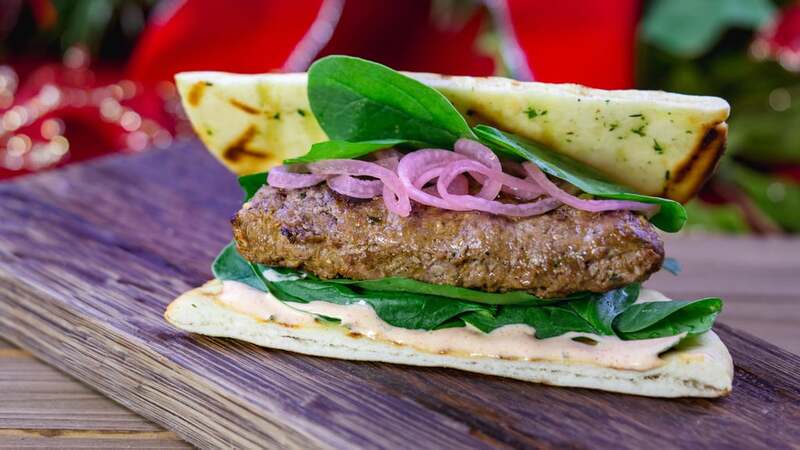 The Lamb Kofta is a plate lamb with tzatziki sauce dip, spinach, and pickled onions (optional) in a grilled pita bread. If you are hungry and want something new to try, instead of getting a corn dog, or a turkey leg I would recommend this. The next food to get at Disneyland is Cinnamon Spiced Fritters with an eggnog dipping sauce, which is cinnamon sugar coated fritters with a eggnog infused bavarian cream. These treats are so good and perfect for the holidays, but only last a limited time, so if you want these different food items go while the holiday season lasts. There are so many treats to get at the park on a daily basis, but what are the best plates of food to get? The first one that is one of the best foods at the Disneyland Resort is the Monte Cristo Sandwich, located at the Blue Bayou Restaurant in New Orleans Square. 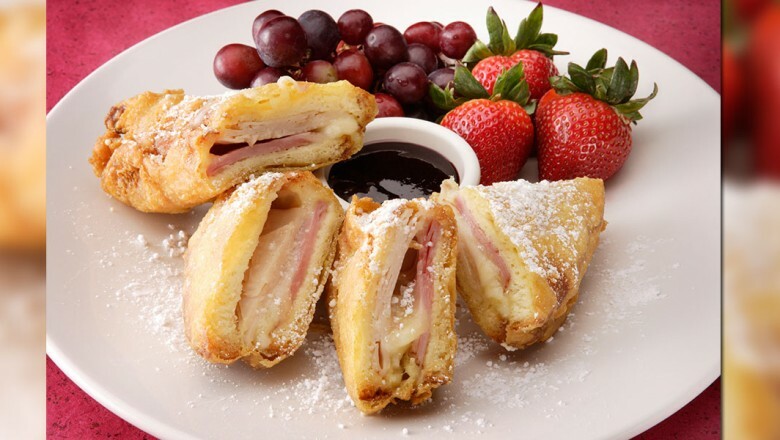 The Monte Cristo Sandwich is a sandwich that is stuffed with, ham, turkey, and swiss cheese. But what makes the sandwich is the berry sauce, and everything in the sandwich together. It is so amazing because the dough of the bread, and the creamy cheese and then the acidity and the sweetness of the sauce, mixed together with the meat, it is just heavenly. 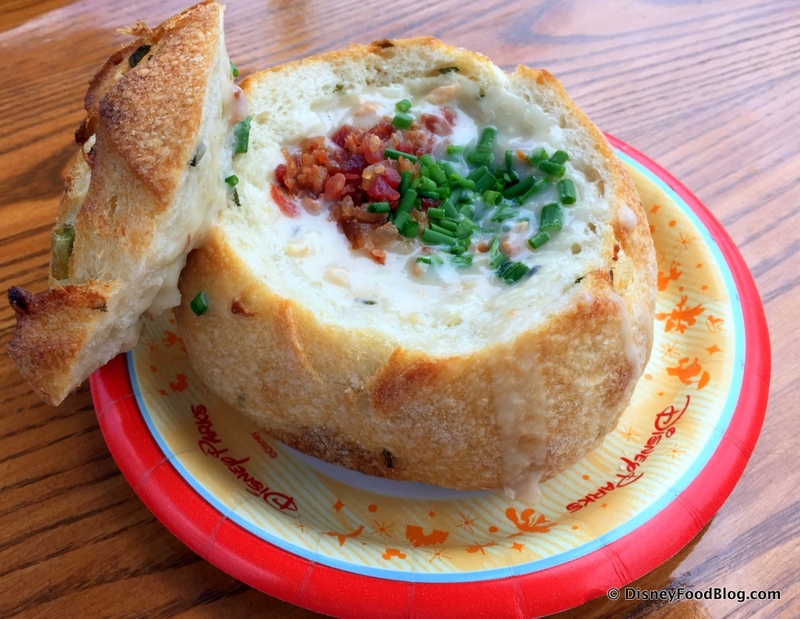 The last and final food that I am going to talk about is the Soup in a Bread bowl in the French Market Restaurant located in New Orleans Square. You can get many different kinds of soups ranging from Tomato Bisque, to Gumbo. But my favorite soup to get is the Clam Chowder in a freshly baked Sourdough Bread. The soup is so creamy, and freshly tasting, and then when you finish the soup the bread is warm and is so good. But what is the best time to come to Disneyland? Well, 7th grader Bella Greene says, “Many people would say Disneyland is special any time of the year, but during the holidays, they put on special events and add a holiday theme to some of their attractions. If you go these are things you should not miss. It’s also great because in town square at the end of main street is where you’ll find a 60 foot tall tree Christmas Tree covered with thousands of lights and ornaments. Sleeping Beauty’s Castle gets sparkly, sporting snow capped turrets and more than 80,000 lights. Elsewhere, don’t expect to see something hanging from every tree branch and light pole, but all the major walkways are always decorated.” The holidays at Disneyland are always magical, and the food is always devine. But, it only lasts from the last week of November-the first week of January. Well, Disneyland is always a great spot for food, especially during the holiday seasons. So, if you happen to be really hungry at Disneyland I would definitely recommend trying these food spots because of how yummy, and flavorful these foods are. I love how yo recommended all the food. I like that you recommended every thing.